Ok, so you guys LOVED my Quarter Card. First the Original, and then the Fish Triple Cut Card which I named as such because it used three pieces of cardstock instead of the four. 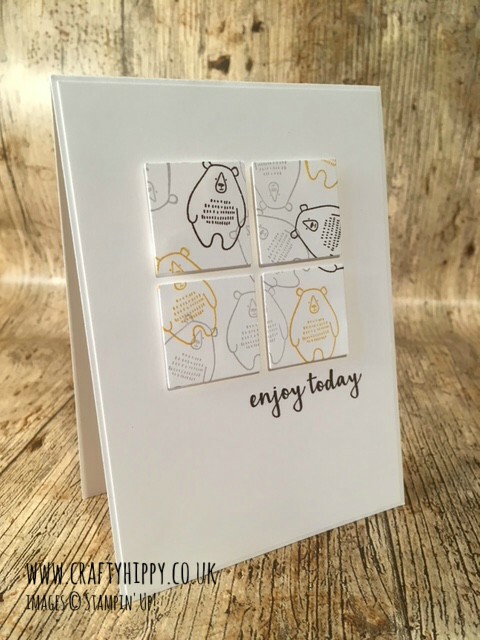 Today's project is a wonderful, clean and simple Bear Quarter Card which uses only one stamp set, Pieces and Patterns, so it's really easy to make. I know you guys will love this so much I've made a video. As I mentioned previously, the possibilities for this type of card are absolutely endless, and I have so many ideas in my head but don't want to bore you endlessly with making them. This project is especially quick and simple because it only uses one stamp set, so is easy to replicate over and over. Apologies for not being able to finish the card completely in the video, my Fibromyalgia is really playing me up at the minute! I really hope you liked this project, hope to see some CASEs about. Back tomorrow with more Stampin' Up! ideas and inspiration.